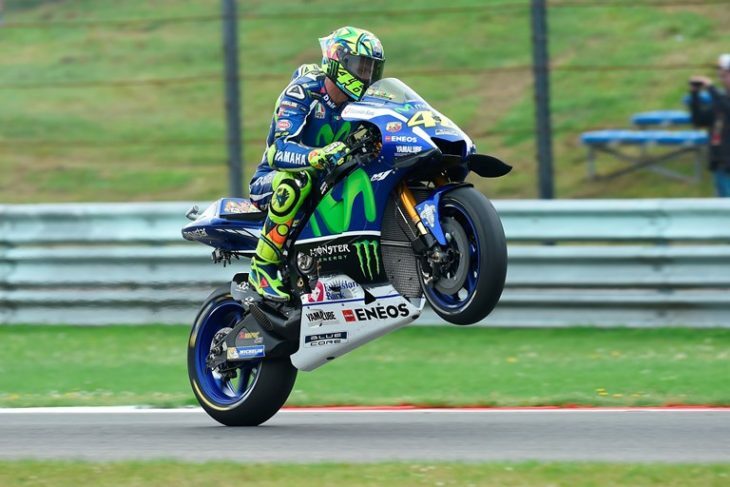 Movistar Yamaha MotoGP’s Valentino Rossi and Jorge Lorenzo showed their intentions for this weekend’s TT Assen round today. The teammates enjoyed two productive free practice sessions, securing second and fifth place respectively in the combined time sheets. Movistar Yamaha MotoGP’s Valentino Rossi and Jorge Lorenzo started the eighth round of the MotoGP World Championship today at an overcast TT Circuit Assen. The teammates set a solid pace early on in the weekend, during what are expected to be the only dry sessions of the TT Assen, securing second and fifth position respectively in the combined times. Eager to claim a position in the top ten, Valentino Rossi needed little time to get a feel for the iconic ‘Cathedral of Speed’. Determined to battle for victory again this weekend, he hit the ground running and climbing to third in the provisional results list on his first stint. He kept this position while working on the balance of his bike whilst comparing the two frames brought by Yamaha until the pace quickened at the end of FP1. His best time, a 1’34.758s, earned him seventh place. The Doctor made great progress in the afternoon. With some rays of sun peering through the clouds, he rode his YZR-M1 to a provisional third position and continued to improve his times throughout the session. He didn’t stop pushing until he set a 1’33.595s lap for second place, only 0.004s from first. Teammate Jorge Lorenzo was also quick on the pace in the morning practice session, climbing up to second after the first ten minutes. Having established a good rhythm around the TT Circuit Assen, he shifted his attention towards fine-tuning the basis set up of his YZR-M1 with both frames. He finished FP1 in sixth position with a best lap of 1’34.722s. The Mallorcan carried forward his solid form in the afternoon. He was keen to head back out on track and gradually built up his pace. He continued to work hard on his setting and dropped under the 1’34 mark at the end of the session. His fastest time of 1’33.991s puts him in fifth place in today’s combined times, 0.400s from the front. Monster Yamaha Tech3 team rider Pol Espargaro got straight on the pace in the Netherlands and closed day one with a positive performance. The young Spaniard began strongly and after completing the first shake down laps, he quickly set about adjusting his Yamaha YZR-M1 to the iconic Assen circuit. He impressively finished the FP1 in 3rd, with a lap time that was a mere 0.074 from the position in front, which left him highly confident for the afternoon. Here, the 2013 Moto2 World Champion carried on his efforts and with rain expected tomorrow morning, he pushed and determinedly posted a best time on his penultimate lap that left him only half a second from the top. Espargaro now optimistically looks on to the all-important qualifying shootout at the Cathedral of Speed. On the other side of the Monster Yamaha Tech3 pit box, Bradley Smith concluded a solid opening day at the historic Dutch circuit for the 8th round of the 2016 MotoGP World Championship. The 25-year-old instantly jumped into action when the morning session kicked off and he started the initial work as he looks to seal a strong placement in Sunday’s Grand Prix. He finished in 9th with a time that was only 0.269 behind his teammate. Then, when Free Practice 2 commenced, the Briton continued his tireless work as he made adjustments to the setup of his Yamaha YZR-M1 and also made progress with the Michelin tyres as he gathered information for his race choice. He eventually completed 21 laps, setting his best time on the penultimate one and now he confidently awaits the second day of action at the Motul TT Assen.